OH MY GOSH.. i think i almost died.. taht is sooooo cute!! its been so long since i've been here! i've missed your posts eki! <3 and this definitely made me smile! hahaha! soooo cute!!!! i havn't seen a doggie smile that big before! EEp adorable! Isn't the same type of doggie breed from the old Japanese story? The one where he waited for his owner? I saw this on youtube! she's really cute! i want a dog like that too..
it looks really glad that his master is about to take him to walk! it really start my day right! OMGggggg. I always love Shiba inu!! And this is soooooo cuteeee!! Moreover the cinema is showing Hachiko A Dogs Story now. I haven't catch it yet. Aw, that really is cute. Thanks for bringing a smile to my face Eki! aww the dog is so friendly! Watching that makes me miss my dog Heidi. She wags her tail so hard whenever we get home. I can't believe that doggie actually smiles! 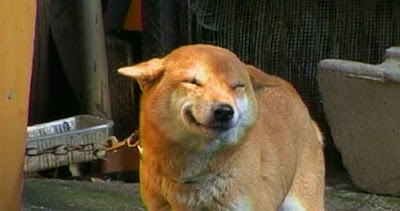 LOL~~ shiba inu are so cute... they always smile!! i wonder why..?? oh frick that is the cutest dog EVERRRR!! !